I was talking to a writer friend last night about the disconnect between the release date of a book and the last time the writer worked on it. Unless you’re a top tier seller, the gap between the day you turn in the final draft and the day it appears on shelves can be significant. For The Iron Hound, which comes out in just under three weeks, it’s nearly a year. There were a couple rounds of revisions thrown in there, but those came with several month gaps between them, so I had to reacquaint myself with the story to make sure I wasn’t revising in new mistakes that I would have to correct later. This gets weird when it comes time to promote a book. The author has often moved on to the next project, and in some cases is several books down the line. 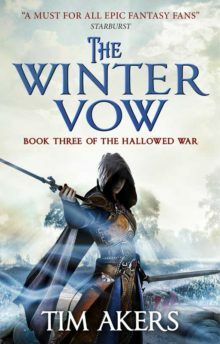 Since I submitted The Iron Hound, I’ve written two pitches, completed three gaming contracts, written a short story, and started book three in the Hallowed War series, tentatively titled The Winter Vow. That’s a lot of words between me and that book. I guess that as writers we exist in the space between finishing a book and the reader actually reading it. There’s this terrible delay. Other than the direct feedback of my agent and my editor, I don’t know how well a book is working until readers start reacting to it, and that reaction trickles in over a long period of time. My first book recently got a positive review nearly nine years after I wrote it. In some ways, a writing career feels like piloting a tanker through the dark. Adjusting for failed experiments, improving the craft, finding new and better ways to reach your readers, these are all incremental changes that a writer makes, the effects of which won’t be seen in public for years. It’s one of the faults in the art form, and it’s especially apparent in a world that expects agile response times and constant interaction. I don’t write with you in the room, looking over my shoulder. But maybe that’s a good thing. These books I write are the purest possible artistic expression for me. Maybe you’ll like them, maybe you won’t. There are certainly things I can improve. But if I do, you won’t see the result of that for a long, long time. Be patient. Writing is a game of creative waiting. Reading is a hobby of creative anticipation.